I thought it was extremely fitting to have my first post of December to be a giveaway for a precious christmas ornament. 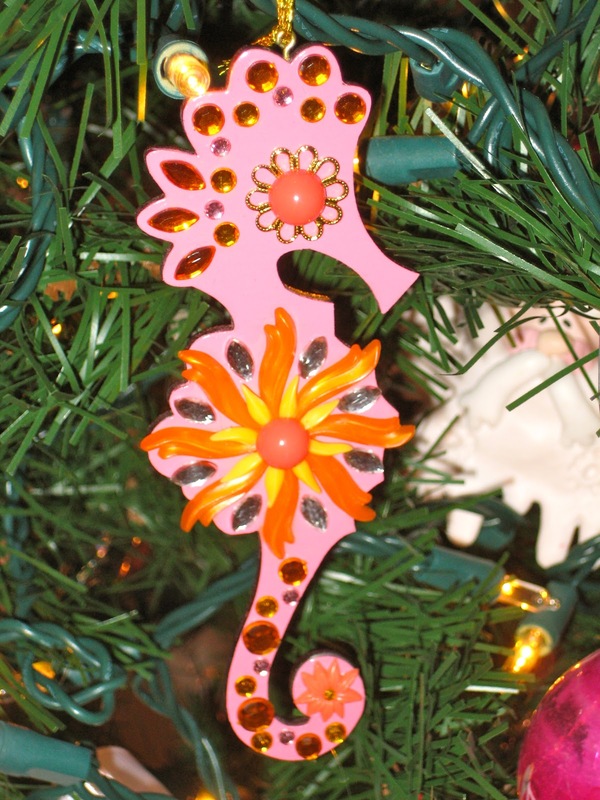 This ornament is from one of my new favorite etsy shops, Midwest Maude. She sells the cutest and fantastically colorful christmas ornaments and jewelry. 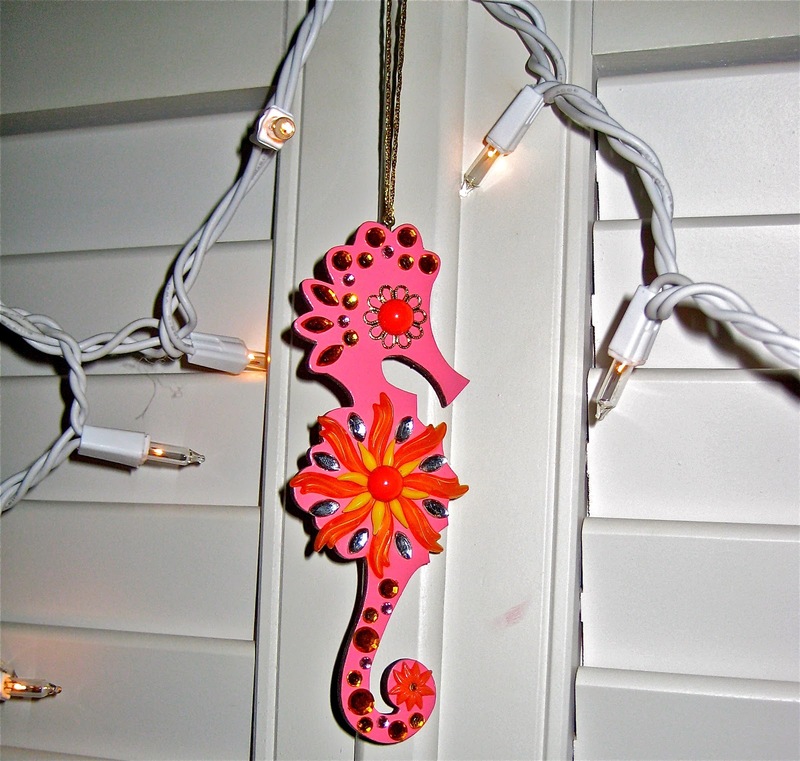 One of you has the opportunity to win this pink and orange seahorse ornament that would look adorable in someones room year round! I highly recommend checking out this etsy shop because the ornaments couldn't be more unique and fun! They are the type of thing you would hate putting away once Christmas has ended! 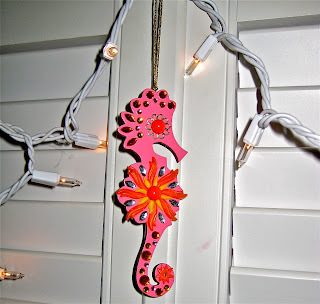 Once you have done those three things you will be entered to win this precious little seahorse! Giveaway ends Monday December 10th! I really like the Peacock ornament! I really like all of the Mod Flower rings! PEACOCK ORNAMENT is just too precious! I'm a big fan of the owl necklaces! I favorited. I follow your blog and favorited Midwest Maude. I love the navy owl necklace. It's so cute! Love the seahorse and the peacock ornament!! Following you and favorited Midwest Maude! my favorite product is the nesting doll ornament! My sister is adopted from Russia! I hope I am not too late for this giveaway! I entered and I love the peacock ornament! I am just now becoming interested in blogging and I am so glad I discovered your site! For anybody who is possibly not attending get the only person deploying it, cartier replica sale are definitely the many other individuals who are own numerous sturdiness together with workout stages. Make certain to find the piece of equipment utilizing varying battle which means that consumers of the workout stages will utilize the rower. Regardless if the slicer is only on your behalf, varying battle a great possibility given that mainly because an individual's sturdiness together with fitness level expand, which means that should any battle provided by the slicer to ensure you wouldn't really need to are worried about "outgrowing" it all. Buying the cartier replica sale products and services within the ideal point in time is certainly the way in which North american Workout Group spares some of our users revenue, as you may input any workout online business. You'll find remodeled gym equipment together with re-manufactured gym equipment to purchase together with allows you to assistance an individual's hublot replica sale reach your fitness goals, most of despite the fact that saving you revenue. With treadmills, elliptical/cross dog trainers, together with stationary supplies methods, that will sturdiness machines, free weights together with products, you'll find any put to use gym equipment at this point to satisfy an individual's fitness necessities, utilizing distribution that will from either of the five serious freight distribution cities worldwide. Some of our facility at the same time facilitates North american Workout Group to receive together with support longines replica sale, to make sure that some of our users will stress many other preferences along with their put to use gym equipment obtains, and we will wrap an individual's valuables during the most effective process to conserve everyone revenue. We need to encounter your corporation necessities, as you may job omega replica sale being able to help customers encounter your workout necessities.